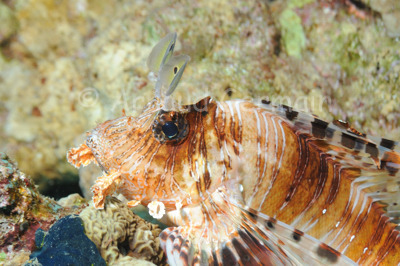 I find the lionfish to be beautiful. I especially like the kinds of antennae they have above their eyes that look like little fish. This one was resting on a coral outcrop, waiting for baitfish to swim by. At night, they become active hunters and swim actively on the reef in search of prey. In some places, they are even dangerous during night dives as they have learnt to follow the halo of the divers’ lamps in search of prey. Ras Katy, about 15 metres down, Sharm El Sheikh, Egypt.